The Hurricanes return to Westpac Stadium in 2019 for seven home games, including four NZ derbies. Gather the family, your colleagues or friends and enjoy watching fantastic footy action from the comfort of the Westpac Stadium Members Club lounges. 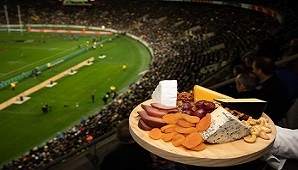 Please ensure you read the Terms and Conditions of booking hospitality at Westpac Stadium. Ripped, frayed or torn clothing. Jandals/flip-flops, slippers, UGG boots, gumboots or bare feet. “Stubbie” style shorts or sports shorts. Swim or beachwear, including board shorts. For men, sleeveless singlets or tank tops. For women, revealing tops or inappropriate length shorts, skirts or dresses. Please note: Sandals, which have straps that secure at the ankle, are acceptable. All clothing must be tidy and presentable. Members, their guests and hospitality guests will be denied entry to the Members Club if they do not meet these requirements.